The city of Sacramento has installed digital license plates on some of its vehicles, turning the vehicles into carriers of multi-function digital displays. The city has installed 24 of the plates on its fleet of Chevy Bolts and plans to install another 11 when it receives more of the vehicles, according to Reviver Auto, maker of the interactive plates called Rplate Pro. 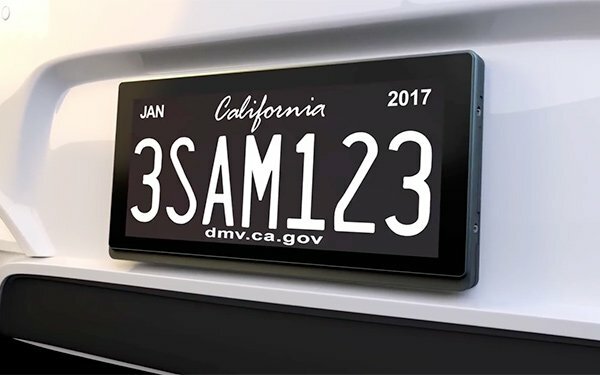 The plates transform the traditional license plate into an interactive display that can be used for showing personal messages, automating registration renewals, determining vehicle location, displaying safety alerts or stolen vehicle information and potentially location-based advertising. “In a Home Depot parking lot, you could send ads that speak to what’s in a store,” Boston said last year. “The Rplate Pro offers a host of capabilities that will not only help us better manage our fleet, but also will also serve a critical role in communicating with our residents,” stated Mark Stevens, city fleet manger in Sacramento. He said that the city would add digital plates as it adds more electric vehicles, which comply with the city’s sustainability requirements. California was the first state to adopt the Rplate Pro, followed by legislation allowing the testing in Arizona, Texas, Florida and Washington State. The plate is actually a screen with protecive glass, as detailed in a company video. 6 comments about "Smart Digital License Plates Launch In First U.S. City". R MARK REASBECK from www.USAonly.US , June 5, 2018 at 10:27 p.m.
Well, now we have the 2nd worst idea of the 21st Century behind the sellf driving car. First question, How much more does it cost above the $1 it costs to make a license plate from an aluminum stamp? Wait till the hackers figure this one out. They could put an Amber Alert number out on an unsuspecting car. Will it flag "Expired" when your phone app to register your car has a conflict with your bank info?? Again...............why are you giving up your privacy? "n a Home Depot parking lot, you could send ads that speak to what’s in a store,” Boston said last year." It's alll about the advertising buck...............Of course Californa is first, they're nuts!!! Ahhhhhh.... most municipalities have non-expiring plates.......duh, told you they're nuts. R MARK REASBECK from www.USAonly.US , June 5, 2018 at 10:28 p.m.
PS. And the one on the picture is already 18 months expired!! Chuck Martin from Chuck Martin replied, June 6, 2018 at 9:53 a.m.
Nice catch on the expiration date, Mark. Chuck Martin from Chuck Martin replied, June 6, 2018 at 9:54 a.m.
Good point on the price, Mark...looks like in excess of $500 each, at least at the moment. Hence, the plates going on fleet vs. personal vehicles. R MARK REASBECK from www.USAonly.US , June 7, 2018 at 10:03 p.m.
Can't really think of an advantage of this $500 titanic. Wonder who will steal the first one off a car and put it on a getaway car ??? Chuck Martin from Chuck Martin replied, June 8, 2018 at 10:05 a.m. They actually are secured and real-time tracked via the network, Mark.